In response to questions about career development (K) award policies, NIH issued a Guide Notice NOT-OD-17-094, to clarify percent effort requirements for K award principal investigators (PIs), and acceptable sources of research support. We’d like to provide some additional details to put the recent Guide Notice in context with existing K award policies on percent effort. For most K award programs, the K award PI (K awardee) must commit at the minimum 9 person months, equivalent to 75% full-time professional effort, directly to their research project and career development activities. The remaining effort (up to 25%) can be devoted to additional research, teaching, clinical work, or other efforts complementary to career development of the K awardee. NIH provides some salary support as part of the K award, and often institutions will supplement the salary of these K award PIs up to a level that is consistent with the institution’s salary scale. NOT-OD-17-094 clarifies that salary supplementation for the K awardee’s time spent devoted to the career development award and directly related to the research project is allowable, but must be from non-Federal sources, which can include institutional sources, and must not require extra duties or responsibilities that would interfere with the goals of the K award. For additional research projects, the effort not directly committed to the K award (commonly up to 25%), K award recipients may devote effort, with compensation, from Federal or non-Federal research projects as principal investigator, or in another role (e.g., co-Investigator), as long the specific aims of the other supporting grant(s) differ from those of the K award (see Figure 1). K awardees may also be compensated for effort devoted to teaching or clinical activities. Most K programs are mentored career development awards, where a faculty mentor provides guidance to support transition of the K award recipient to independence. On mentored K awards of a 3-5 year duration, NIH policy provides a transitional period to permit the K award PI to apply for and if awarded, lead, an independent research project. 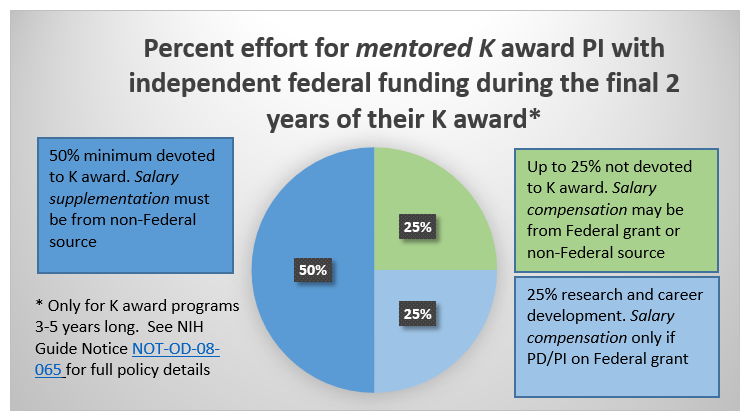 If the mentored K awardee successfully becomes a PD/PI of a peer-reviewed research award from NIH or any other Federal agency during the final two years of their K award, they are permitted to reduce the effort devoted to the aims of the K award project from a minimum of 75% to a minimum of 50%. As described in NOT-OD-08-065, at the time the new research grant is awarded, this reduced effort on the K award may be replaced by effort and corresponding salary from the research award, so that the combined total research commitment of the PI remains 75% or more for the duration of the mentored K award (see Figure 2). Have additional questions about percent effort and K awards for your K award, or for a specific K award PI at your institution? Contact the grants specialist listed on the notice of award for guidance specific to you. General policy questions may be directed to the Division of Biomedical Research Workforce at NIHTrain@mail.nih.gov. Please speak to the concept of subsumed effort on K awards and whether that still exists. “For most K award programs, the K award PI (K awardee) must commit at the minimum 9 person months, equivalent to 75% full-time professional effort, directly to the K award.”? Please address the % effort regarding a no cost extension for a K awardee. Does the effort need to remain at the 75% full-time professional effort directed at the research project? Yes. K awardees must continue maintaining 75 percent (or any approved) effort) during a no-cost extension. Similar to any other grant, all terms and conditions of award also apply during a no-cost extension. If a PI has a K award and received an R01 in the last year of the K and the R01 effort is concurrent with the K, would they be allowed a no cost extension on the K? If so, would their effort on the K have to be 75% or could it be 50%? And lastly, could the R01 effort still be concurrent with the K while the K is on extension? Question 1: If a PI has a K award and received an R01 in the last year of the K, and the R01 effort is concurrent with the K, would they be allowed a no cost extension on the K? Answer: You may reduce your level of effort on the K to 50%. That said, we recommend consulting with your program officer first as well. Please note that no-cost extensions do not require NIH approval for the first 12 months. Question 2: If so, would their effort on the K have to be 75% or could it be 50%? Answer: It could be 50%, but is subject to approval by the funding NIH Institute or Center. Please also keep in mind that all terms and conditions of award apply during a no-cost extension. Question 3: Could the R01 effort still be concurrent with the K while the K is on extension? Answer: Yes, the 50% effort could be concurrent on the K award. Please note that we recommend consulting with your program officer and grants management staff first. Does this mean you may still only PI a R21 or R03 in your 2 final years of a K award? Or may you PI an R21/R03 before then? The two questions you posed reflect separate NIH policies related to K awardees. Regarding the second question, a different NIH policy (NOT-OD-17-094) states that K awardees may supplement their salary, but only with non-Federal sources, during the entire period of the K award. Further, salary supplementation must not require extra duties or responsibilities that would interfere with the K award’s goals. If the effort is not directly committed to the K award, however, the awardee may devote effort, with compensation, on Federal or non-Federal sources as a program director, principal Investigator, or co-Investigator—as long the specific aims of the other supporting grant(s) differ from those of the K award. Does it constitute overlap when a PI on an R-mechanism gives up his salary on the R because he was awarded a K-award which will now cover the salary (for the first three years since I have a K08)? Also, when giving up salary on an R, the grantee can request to re-budget funds, but the NIH doesn’t take the salary out of the grant and use it as an offset for next year’s award, right? Regarding Question 1 (after clarifying activity code is R21): It depends, and we recommend the PI reach out to their program officials for each grant in this situation. If the research under both awards are the same or similar, then the effort devoted to the R21 is subsumed under the minimum effort required by the K08 award (commonly 75 percent). However, the effort devoted to the R cannot exceed the remaining effort (commonly 25%) if the research is clearly different. Please note that if the grantee requested nearly 100% salary on the K award, then the investigator would likely have to give up effort on the R award. Regarding Question 2: We recommend contacting the grants management specialist at the other funding IC to discuss that issue. If a PI has a K award and received an R01 in the last year of the K and the R01 effort is concurrent with the K,will they need prior approval or communicate with NIH to devote the 75% effort on the K award and certify no effort to the R01? “Provided they remain in a mentored status, mentored CDA recipients in the final two years of their support period are permitted to reduce the level of effort required for the CDA when they have competed successfully for peer-reviewed research awards from NIH or any Federal agency, if programmatic policy of the other Federal agency allows such an arrangement. Recipients are encouraged to obtain funding from NIH or other Federal sources either as a PD/PI on a competing research grant award or cooperative agreement or as a project leader on a competing multi-project award. •	The CDA recipient must be one of the named PD/PIs on a competing NIH research grant application (R01, R03, R15, R21, R34, or equivalent application from another Federal agency) or a sub-project director on a competing multi-component research or center grant or cooperative agreement application (P01, P50, U01, etc. or an equivalent application from another Federal agency). •	The CDA must be active when the competing research grant application is submitted. •	The CDA must be in its final two years before the reduction in effort to 6 person months (50% full-time professional effort) is permitted. For submissions to NIH, a letter must accompany the research grant application from the chair of the mentored award recipient’s department or other responsible institutional official providing: (1) evidence that the recipient will continue to focus on the development of his/her research career; (2) will continue to have access to his/her mentor; and (3) that the recipient’s total level of research effort will be maintained and protected at a minimum of 9 person months (75% full-time professional effort). For submissions to other Federal agencies, this type of institutional commitment letter is strongly encouraged; however, applicants should check with that agency for guidance on the allowability of such a letter. If a PI has a K award and is submitting a request for an Administrative Supplement, can the request include additional funding for salary? Can a PI of a K award apply for and receive an R01 in the first 3 years of a 5-year K grant? Can the grants run concurrently before the last two years by taking no salary support from the R01? The K PI effort not directly committed to the K award (commonly up to 25%), can be devoted to serving as PI or in another role on a Federal or non-Federal grant, as long the specific aims of the other supporting grant(s) differ from those of the K award. If a K awardee needs to increase her effort by a small percentage, is it OK to pay that increase form the K funds providing all the extra effort can demonstrably be attributed to activities related to the K research? Would that increase need prior approval? How is the total effort on the K evaluated at the end of the grant? For example, the awardee in year 1 devoted 8.5m, but in year 2 devoted 9.5m. Would the total level of effort be considerate compliant at the end of the grant? We recommend contacting the program officer and/or grants management specialist assigned to the K award for clarification related to changing the percent effort, salary, and research costs. During Years 1-3, can I become PI on an R21 or R01 at less than or equal 25%? Where is the policy for salary compensation on years 1-3? You may apply for an R01 that differs from the K award and be PI on it, but in the first 3 years you MUST retain at least 75% effort on the K award – so it could be tough to have sufficient effort to be PI on R01 so early. In the last 2 years of the K you can apply for R01 and reduce effort to 50%. Can you devote time for clinic if this is the place where you will recruit patients and have it count as part of your protected research time because it is where you will be collecting patients ? Curious because I’ve heard someone else suggest this but want to confirm if this is true. You cannot count clinic time as research time when you are seeing and providing care to patients in the same clinic as the research project but they are not part of the research project. You may count clinic time as research time if the clinical interaction(s) is part of the research program you have proposed. Can complementary effort without salary support be devoted on non-federal awards that include related research? As described in the NIH Grants Policy Statement (section 12.3.6.1), recipients of mentored career development awards are permitted to devote complementary effort without salary support on other federal or non-federal research grants that are related to the career development award. In such cases, the percent effort on the research grant is subsumed within the effort devoted to the career development award. For further details, please consult with your program officer. If my K award covers 75% of my current salary but I get a salary increase, is it possible to request additional funds to cover the difference? How would this salary change be covered otherwise? We have the maximum amount (of salary) that each IC will award listed in the Table of IC-specific information for each K program announcement, so if the request exceeds that, it wouldn’t be met. On top of that, many ICs don’t award increases in the noncompeting years (although that varies by IC). We strongly recommend reaching out to your GMO and PO.